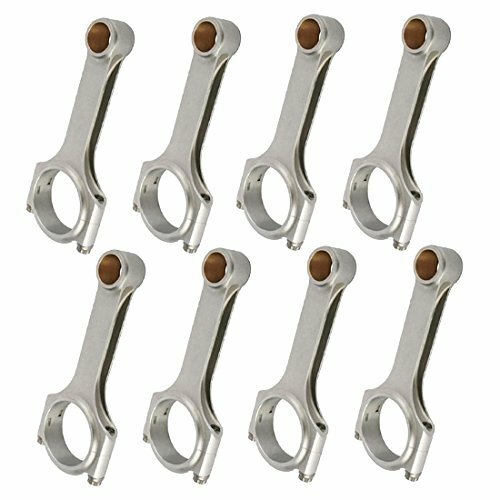 This connecting rod fits mechanical secondaries. It includes a washer and pin. They say that to be successful you must identify a need and satisfy it. Back in 1968 racing enthusiast Gary Holzapfel saw that many of his friends' broken engines were caused by fastener failure. At the time, there were no commercially available studs and bolts up to the challenge. 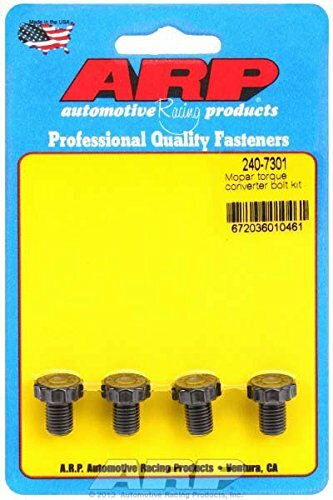 So Holzapfel called upon his many years of fastener making experience for a leading aerospace subcontractor and founded ARP (Automotive Racing Products). In the ensuing years, the firm has grown from what was literally a backyard garage workshop into a highly diversified manufacturer with five operational entities in Southern California with a combined area in excess of 200,000 square feet. These include forging, machining, finishing and packaging/warehousing facilities in Santa Paula and Ventura, California. There is even a unique racing-themed restaurant at the main Santa Paula facility - called "Hozy's Grill" - which is open to the public. Today, ARP's product line contains thousands of part numbers, and has expanded to include virtually every fastener found in an engine and driveline. These range from quality high performance OEM replacement parts to exotic specialty hardware for Formula 1, IndyCar, NASCAR and NHRA drag racing and marine applications. To maintain a reputation for "zero defects", ensure optimum quality control, and produce fasteners of exceptionally high quality, ARP controls all aspects of the manufacturing process, performing all operations in-house where they can be closely monitored. 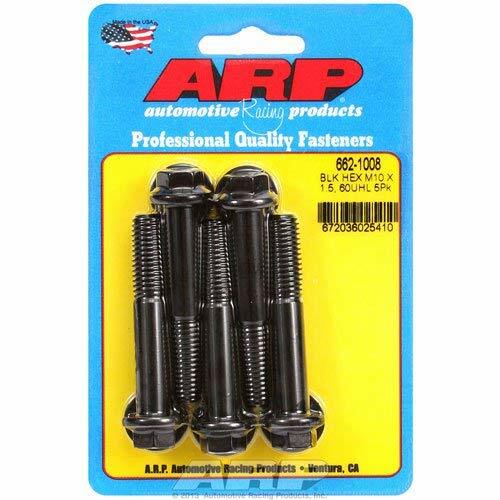 This motor mount bolt kit is a good example of how ARP takes extraordinary steps to produce the very finest products of their kind on the market today. 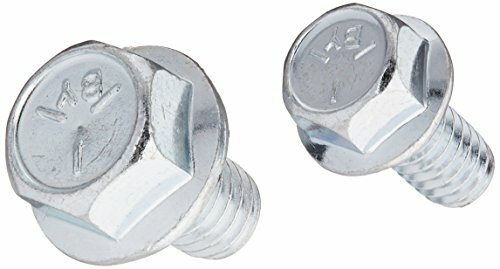 These bolts are manufactured from corrosion-resistant stainless steel, which is rated at 170,000 psi. 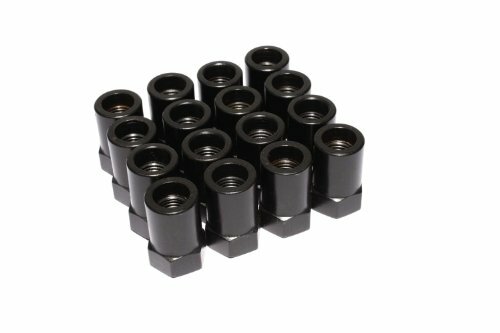 They feature conventional hex style heads, come complete with high quality flat washers, and will help you secure your engine with complete confidence. 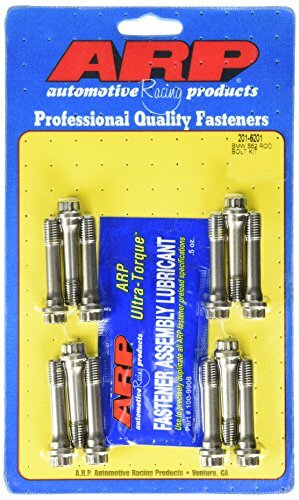 General Motors 200, 700, 4L60 4L80 (6 pieces truck), .590 Under Head Length, M10 x 1.5 Thread Size, Pro Series ARP Torque Converter Bolts 230-7405With ARP Torque Converter Bolts You can forget about the problem of shearing a torque converter bolt after you install these super strong 200,000 psi gems.They are designed for each specific application and provide the optimum grip. Kits come with hardened parallel-ground washers. 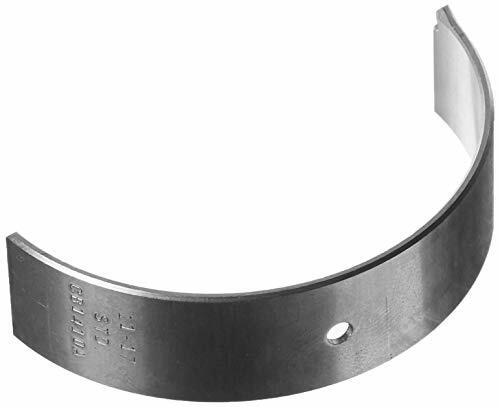 Manley guarantees tight tolerances where wrist pin and big end bores are honed to plus or minus .0002 in. 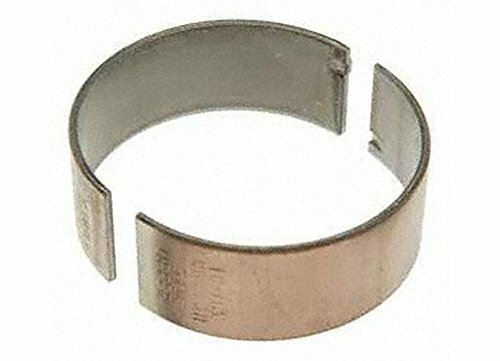 tolerance and the wrist pins get a bronze alloy bushing for superior fatigue resistance. 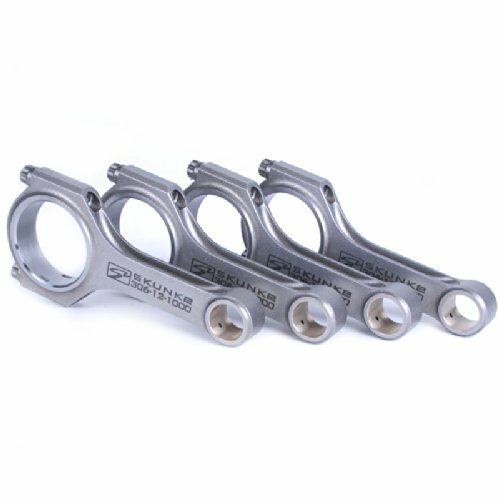 COMP Cams Magnum Polylocks are best for moderate lift and spring pressure applications. Designed for ultimate strength and locking force. Hi-Tech Polylocks work well in all high end race applications. The stud girdle polylocks are precision ground for minimum run out and tapered for extra strength in the locking area. 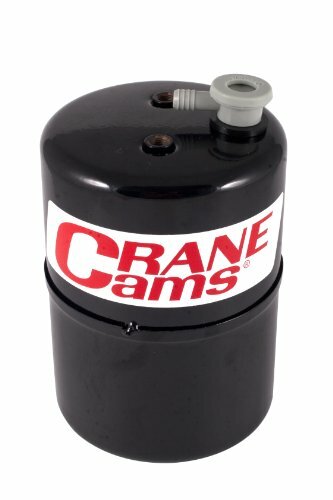 Crane Cams Vacuum Reserve System features a Crane Cams 99590-1 vacuum reserve system. 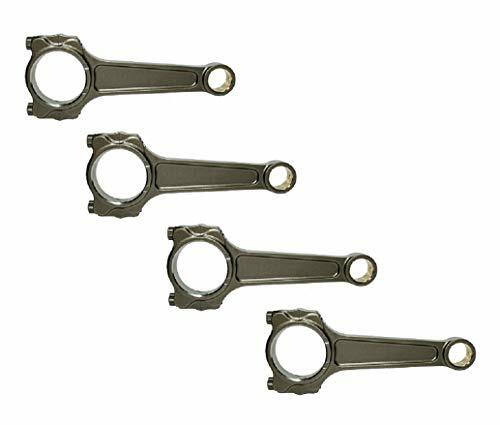 Skunk2 is proud to introduce its all-new Alpha Series Connecting Rods for Subaru's EJ25 engines. Alpha Series Rods are forged from select 4340 chromoly steel and feature a straight H-beam design, resulting in the ultimate strength-to-weight ratio. 4340 chromoly is one of the strongest materials available, however, not all 4340 chromoly is the same. As such, Skunk2 relies on extensive material testing and works closely with its foundry to produce high-quality rods at an affordable price. Comprehensive heat-treating, tempering, and shot-peening processes together ensure that each Alpha Series Rod remains consistent and strong. Finally, each rod is magna-fluxed to ensure integrity and that each process has been completed thoroughly and according to Skunk2's rigid specifications. 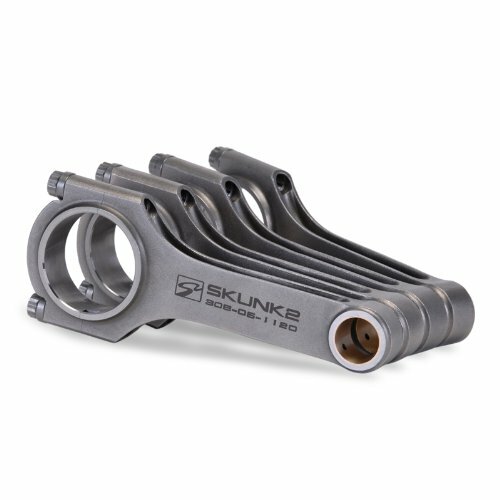 Warranty: Skunk2 Racing warrants all products to be free from defects in materials and workmanship for normal use and service, regardless of mileage, for a period of time not to exceed 12 months from the original date of retail purchase. Parts returned must be determined by Skunk2 Racing to be defective prior to any warranty credit or replacement is issued. Skunk2 Racing's obligation under warranty shall be limited to repairing or replacing, at its discretion, any part proven defective. The customer must prepay transportation charges. Final determination of the suitability of the products for the use contemplated by the buyer is the sole responsibility of the buyer. Alpha Series rods are forged from select 4340 chromoly steel and feature a straight H-beam design, resulting in the ultimate strength-to-weight ratio. 4340 chromoly is one of the strongest materials available, however, not all 4340 chromoly is the same. As such, Skunk2 relies on extensive material testing and works closely with its foundry to produce high-quality rods at an affordable price. Comprehensive heat-treating, tempering, and shot-peening processes together ensure that each Alpha Series rod remains consistent and strong. Finally, each rod is magna-fluxed to ensure integrity and that each process has been completed thoroughly and according to Skunk2's rigid specifications. Because there are fairly wide tolerances in factory bolt holes, the bolt must be able to fit snugly and a knurl is applied. 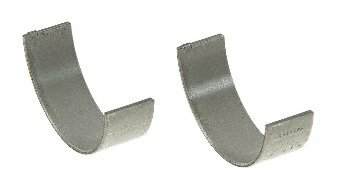 Unfortunately, these knurls cut deep into the bolt material, leaving sharp edges and enormous stress risers that promote failure. 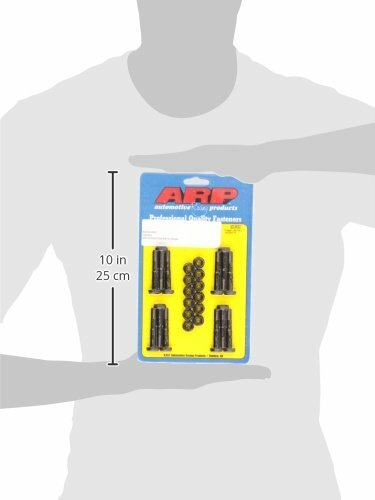 That s why ARP developed the ARP Wave-Loc design that features symmetrical waves and provides an effective interference fit without creating stress risers in the bolt or the rod. 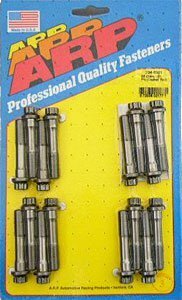 Installing starter motors in the cramped confines of a race car is simplified by use of ARP's special bolts, which feature small diameter heads to make accessibility more convenient. 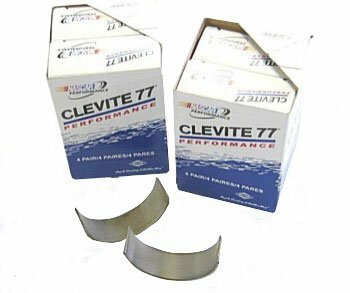 At 170,000 psi, they are stronger than OEM and industrial grades, and especially suited for use on cars that use rear motor plates. 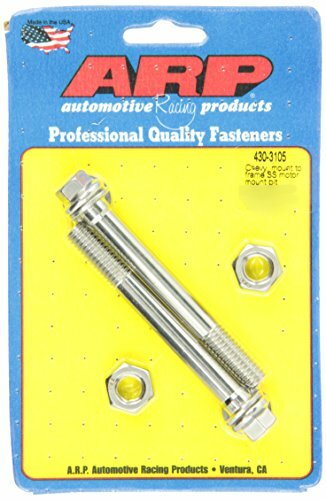 These starter bolts are made from ARP 300, a 100% maintenance free stainless steel material that is stronger than Grade 8 hardware and tough enough to easily withstand the strain of a 10 to 15 pound starter cantilevered off the back of an engine. 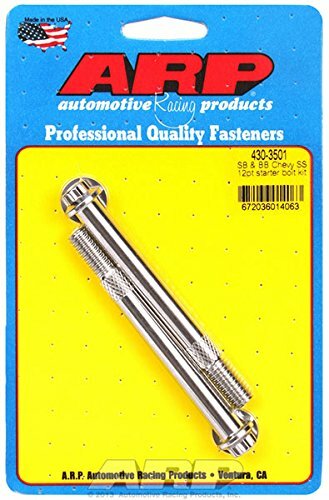 The bolts have standard shank knurling, compact 12-point heads, and an under head length of 3.700. 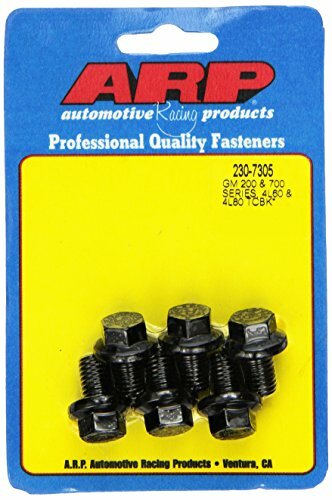 This kit includes washers (as required) and is designed for select Chevrolet applications. 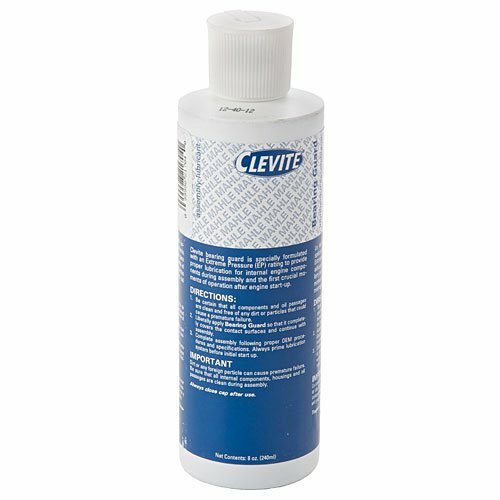 Designed especially for firmly holding oil pans in place and not loosening up. Features a built-in washer face with case-hardened serrations. 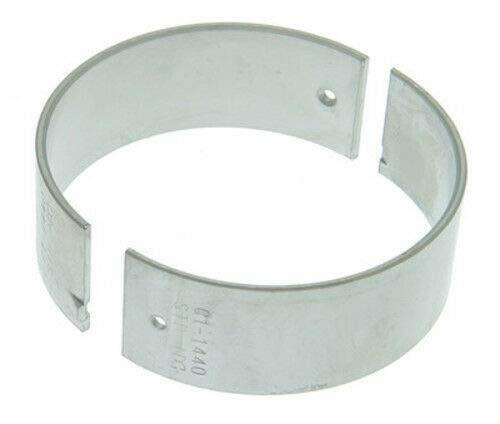 The washer face and small head permits the use of a socket wrench for quick and accurate installation. Construction is such that they can be re-used.